iOS 6.1.4 update is released in public. Apple has just released the iOS 6.1.4 update to iPhone 5 users only, which means that iOS 6.1.4 is not going to launch for any other device in iOS lineup. iOS 6.1.4 update comes with only one noted changes in the logs. iOS 6.1.4 is available to download from iTunes, and as well as via OTA update on your iPhone 5. 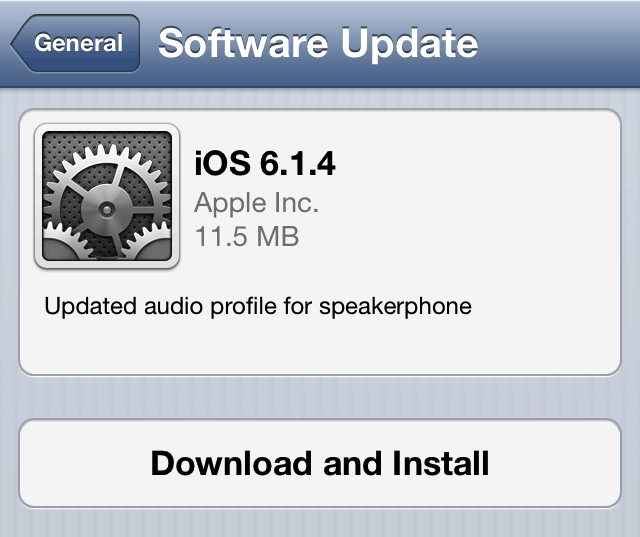 The latest iOS 6.1.4 features the ‘updated audio profile for speakerphone’ of iPhone 5. This is actually not a major update from Apple to iOS users, but if you still want to keep your device up to date, and avoid any kind of issues with your device then it is recommended to update your device to latest iOS 6.1.4 via OTA. In March, Apple released iOS 6.1.3 update for all devices that fixes the iOS screen lock bug, and major iOS security exploit discovered by Evad3rs to develop iOS 6.1.3 Untethered Jailbreak.